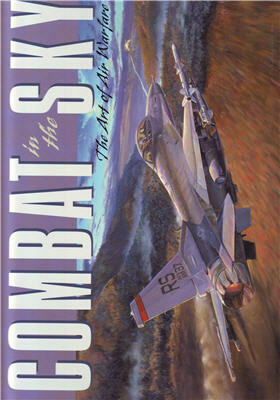 Combat in the Sky vividly portrays the heart-stopping drama of aerial combat in over 85 full-color paintings and illustration paintings by the worlds leading aviation artists from North America and the United Kingdom. Artwork from the world’s famous artists include Keith Ferris, James Dietz, William Phillips, and Craig Kodera. This artful time capsule offers a glimpse at history-making planes such as the Enola Gay, through the fighters and bombers of the Korean and Vietnam wars, to the high-tech aerial weaponry of Desert Storm and the modern era. While these stunningly captivating works of art serve as the books core, descriptive captions for each painting and an authoritative and informative text create a cohesive whole. 204 pgs, HB w/dust jacket, 12 x 10.5, 150 photos & paintings.